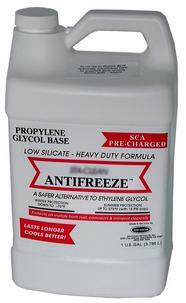 Propylene Glycol - Dog Food Aid or Automotive Antifreeze? Propylene Glycol — Dog Food Aid or Automotive Antifreeze? Propylene glycol is a controversial additive used to help preserve the moisture content in some commercial dog foods. You may already recognize this chemical for its more everyday use — as the key component in newer automotive antifreeze. However, propylene glycol is considerably safer (less toxic) than its far more dangerous cousin — ethylene glycol. Yet because of its proven ability to cause a serious type of blood disease in some animals — Heinz body anemia — propylene glycol has been banned by the FDA for use in cat food. Propylene glycol is probably safe — in small, infrequent doses. For this important reason, pet owners may wish to consider the potential long term consequences of including this or any other non-nutritive additive in any food when making a purchase.